For the past couple of months, Polish cinema has been all over Chicago. The Gene Siskel Film Center is about to wrap up "Martin Scorsese Presents: Masterpieces of Polish Cinema," a program featuring some of the country's best films—over a dozen of them in total. Meanwhile, at the Music Box, Paweł Pawlikowski's J.R. Jones-approved Ida has enjoyed a prolonged residency. All national cinemas have distinct attributes and Poland is no exception: Scorsese himself puts it quite succinctly in his introduction to "Masterpieces of Polish Cinema" when he writes, "This is a cinema of personal vision, social commitment, and poetic responsibility . . . the subtext of great conflict and cultural identity is universal, even if you don’t know the history of Poland, the themes in these films will resonate, as they did profoundly for me." The idea of "social and poetic responsibility" strikes me as the key attribute of Polish cinema. In the country's best films, which are often grave and somber but never stifling or unbearable, the national consciousness is alive, reflected in austere black-and-white cinematography, precise compositions, and lyrical imagery. Indeed, a sense of moral and aesthetic duty, as well as a calculated national identity, is the very foundation of Polish film. Here are my five favorite. 5. Ashes and Diamonds (dir. Andrzej Wajda, 1958) This audacious character study, a seminal achievement in Poland's national cinema that helped spur the country's New Wave, serves as a chilling document of an entire generation of Poles still reeling from WWII fallout. The film is edgy and stylish, and like all of Wajda's best films, it exists in a sort of moral middle ground, direct but never didactic in its political and social viewpoints. 4. Camouflage (dir. Krzysztof Zanussi, 1977) Ben Sachs recently wrote at length about director Krzysztof Zanussi, one of the most interesting figures in not just Polish cinema but world cinema, period. Camouflage is my favorite of the three he mentions in his piece—I particularly appreciate the way its modest scale belies some deeply profound ideas about personal ambition and the frailty of human connection. 3. Knife in the Water (dir. Roman Polanski, 1962) One of the best debut features ever made, Polanski's first film is a cagey chamber drama that toys with audience expectations and takes significant liberties with traditional storytelling and characterization. The small cast, confined setting, voyeuristic camera, and looming threat of violence are trademarks the director carries to this day. 2. Barrier (dir. 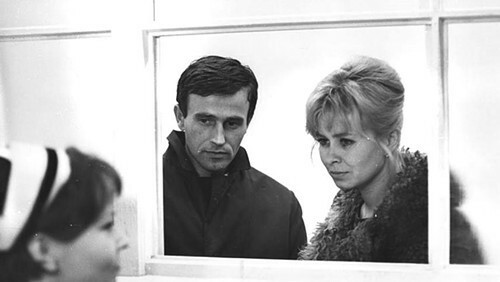 Jerzy Skolimowski, 1966) It could be said that Jerzy Skolimowski's best films were made outside of Poland (Deep End, Moonlighting), but his influence on Polish cinema is nevertheless profound. My favorite of his native features is this eccentric coming-of-age comedy about a wayward college grad whose gradual detachment from society forces him into an existential funk. Free-form, idiosyncratic, and often hilarious, it's the film The Graduate tried to be. 1. The Decalogue (dir. Krzysztof Kieslowski, 1987) A truly monumental achievement. Krzysztof Kieslowski's expansive take on the Ten Commandments represents cinematic storytelling at its most comprehensive, detailing disparate stories—the film is comprised of ten 50-minute segments—that connect in profound and surprising ways. (Not since Bigger Than Life had milk played a more significant thematic role.) The whole thing would be enough on its own, but The Decalogue also spawned a pair of great films in their own right: A Short Film About Killing and A Short Film About Love.